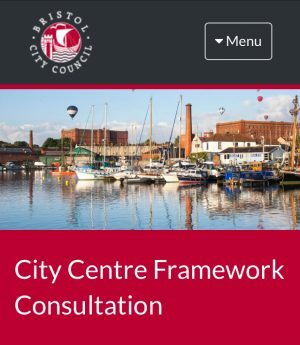 We welcome the CCF document and agree that our City Centre should provide a high quality walking and cycling environment for all ages, abilities and genders. People are already choosing to walk and cycle into the City Centre for everyday journeys in high numbers, often despite a poorly connected network of routes and facilities, and an environment which is dominated by motor traffic. If we want to build a successful Bristol for the 21st Century we need to move away from machine dominance and to an environment built around people. The CCF, in our view, is overly influenced by urban planning and travel ideas from the mid 20th Century (eg motor cars, multi storey car parks and slow, stopping diesel buses on narrow streets). Cities which prosper in the coming years, will in our view, be those which people find pleasant and enjoyable to visit and work in; in part because they have an attractive appearance and environment. Access by motor car will, in the next 50 years, not be anything like as important as it has been in the last 50.
the objective must be movement of people, not movement of vehicles. motor traffic volumes in city centres need to be reduced to improve air quality and encourage more walking and cycling, and this requires some physical restraint, with permeability for cyclists. road space should not only be re-allocated from motoring to cycling, but also cyclists should be segregated from motor vehicles (including buses) on all busy roads. people on bicycles should be segregated from people on foot where volumes of walkers and cyclists are high. This avoids conflict and allows quicker cycling. car-dependent travellers going to the city centre should be encouraged to transfer to a more sustainable mode (public transport, cycle hire, secure cycle storage, walking) as early as reasonably possible in their trips. The majority of people do not travel to work in the city centre by car, but congestion impacts everyone,causing delays and unreliable bus services, andworsening conditions for walking and cycling. Manybus routes across the city travel through the centralarea, with delays in the centre causing knock on effectsacross the city. The majority of congestion in the city centre in the morning peak is caused by commuting. The evening peak is caused by a mix of commuting and leisure trips. The success of the city centre is generating large volumes of travel demand, that are set to increase in future, causing congestion problems during the peakperiods and increasingly throughout the day. Sustainable and healthy modes of transport such aswalking, cycling, bus, and trains already play a vitalrole in the success of the city centre. The majority of people travelling to work in the city centre do so by sustainable and healthy modes of transport, and this is set to increase further in the future with intensified urban living and improved public transport connections. The proposals set out in this framework are needed to help encourage a continuing shift to sustainable and healthy transport. This will make best use of thelimited road space we have available and ensure themaximum number of people can reliably and efficiently move to and from the city centre. We cannot create any more land, so need to make best use of the land available. Sustainable modes of transport are much more space efficient than the private car, allowing a larger number of people to move in the same amount of space. Sixty percent of people driving to work in the city centre do so from other local authority areas. This highlights the need for Bristol City Council to work with our neighbouring local authorities to provide sustainable and healthy transport options across theregion, as we are doing with the Joint Transport Studyand other initiatives. Transport and movement can play a substantial role in achieving better health and air quality. Around 47% of Bristol residents report being obese or overweight, and building active travel in to everyday life can play a big role in healthier lifestyles. Air pollution also has a negative impact on health, and is estimated to causearound 300 early deaths per year in the city. Emissionsfrom diesel vehicles are the dominant factor in poor air quality, and encouraging a shift to more sustainable and healthy modes of transport will continue the reduction in harmful emissions. Sustainable and healthy transport also plays a key role in tackling inequality, providing access to jobs, leisure,and services. People in the most deprived areas of Bristol are far less likely to own and drive a car, and farmore likely to walk or get the bus to work than peoplein the least deprived areas. Around 40% of jobseekers say that a lack of personal transport, or poor public transport, is a key barrier preventing them from getting a job. There is only one aim set out for cycling and it’s not a bad one about completing a ‘Triple A’ (All Ages and Abilities) segregated cycling network, but we’d like to have seen more about managing speeds and volumes of traffic generally. Around a third of Bristol residents regularly ride a bicycle, and cycling plays a key role in supporting thecity centre economy, as well as bringing about healthand environmental benefits. There are a number of high quality segregated cycleroutes throughout the city centre but the network has several missing links which discourage people who are concerned about cycling on roads in busy motortraffic and are preventing more people from cycling. Our Bike Life survey in 2015 found that 80% of Bristol residents support increasing the safety of cycling, with segregated cycle routes the most popular format. The A38 North Street / Gloucester Road to the city centre is a key missing link in the cycle network. Thisis the city’s busiest cycle route, busier than the Bristol and Bath Railway Path, with bikes accounting for a third of total vehicles in peak times. Upon reaching the city centre people on bikes are confronted with the St James Barton multi-lane roundabout and dual carriageways, which is a significant deterrent to manypeople. Other key missing links are on Union Street, Bond Street, Temple Way, Victoria Street, Whiteladies Road to the city centre, and A38 Bedminster Parade to the city centre. 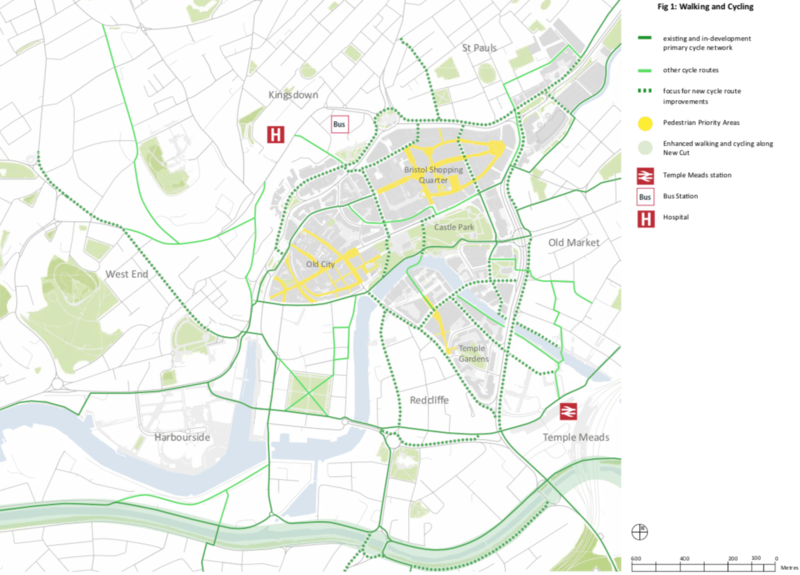 This framework proposes completing the city centre cycle route network to support continuing growth in cycling in the city. Corridors for future cycle routeimprovements are indicated on Fig 1 – Walking and Cycling diagram. If the principle of improving these corridors is supported, further work will be undertaken to confirm the extent of cycle route improvements that could be delivered in each location, with the aim being to achieve fully segregated cycle routes in most locations.